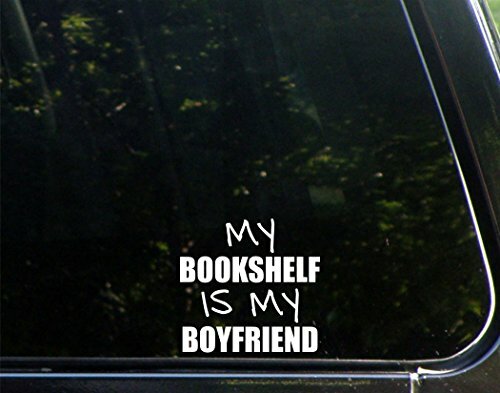 My Bookshelf Is My Boyfriend - 4"x 3 3/4" - Vinyl Die Cut Decal / Bumper Sticker For Windows, Trucks, Cars, Laptops, Macbooks, Etc. Decal is easily applied and removed to any clean, smooth, flat surface. Made of 7 years premium quality outdoor vinyl material, waterproof, self-adhesive. Decal has clear application tape over the top for easy application. Once the decal is applied, clear application tape is removed. The only thing to be applied is what appears in white.